Figure 1. Invoking Options for Target Configuration Manager. Figure 2. PEMicro Debugger Connection Selection. Figure 3. PEMicro Connection Manager. PEMicro has a collection of USB Multilink debug probes, Cyclone programmers with USB and Ethernet port support, and OpenSDA debug hardware (embedded on many NXP development boards). Figure 4. PEMicro Debug Interface Selection. PEMicro's USB and local Ethernet devices are automatically detected. Remotely networked Ethernet debug interfaces may be specified via their IP address. 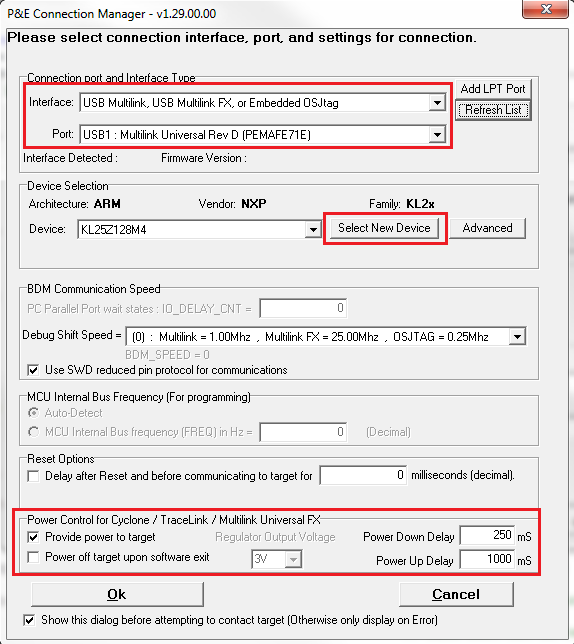 If you are working with PEmicro's Multilink FX or Cyclone debug interfaces, please consider configuring them to provide power to your target device via the Power Control settings at the bottom of Connection Manager. Figure 5. PEMicro Target Device Selection. Figure 6. Launching a PEMicro Debug Session. As demonstrated above, PEMicro's fully integrated run control and FLASH programming support allows developers to easily use PEMicro's Multilink and Cyclone manufacturing interfaces to program and debug ARM processors across Evaluation, Development and Manufacturing stages of their design cycles.